Robert Houghwout Jackson (February 13, 1892 – October 9, 1954) was United States Solicitor General (1938–1940), United States Attorney General (1940–1941) and an Associate Justice of the United States Supreme Court (1941–1954). He is the only person in United States history to have held all three of those offices. He was also the chief United States prosecutor at the Nuremberg Trials. The priceless heritage of our society is the unrestricted constitutional right of each member to think as he will. Thought control is a copyright of totalitarianism, and we have no claim to it. It is not the function of the government to keep the citizen from falling into error; it is the function of the citizen to keep the government from falling into error. The office of the lawyer, however poorly filled, is too delicate, personal and confidential to be occupied by a corporation. Our people do not want barren theories from their democracy. Maury Maverick has expressed very quaintly, but clearly, what they really want when he says: 'We Americans want to talk, pray, think as we please — and eat regular'. He loved his profession, he had a real sense of dedication to the administration of justice, he held his head high as a lawyer, he rendered and exacted courtesy, honor and straightforwardness at the Bar. He respected the judicial office deeply, demanded the highest standards of competence and disinterestedness and dignity, despised all political use of or trifling with judicial power, and had an affectionate regard for every man who filled the exacting prescription of the just judge. The law to him was like a religion, and its practice was more than a means of support; it was a mission. He was not always popular in his community, but he was respected. Unpopular minorities and individuals often found in him their only mediator and advocate. He was too independent to court the populace - he thought of himself as a leader and lawgiver, not a mouthpiece. Often his name was, in a generation or two, forgotten. It was from this brotherhood that America has drawn its statesmen and its judges. A free and self-governing Republic stands as a monument for the little-known and unremembered as well as for the famous men of our profession. On your first appearance before the Court, do not waste your time and ours telling us so. We are likely to discover for ourselves that you are a novice but will think none the less of you for it. Every famous lawyer had his first day at our bar, and perhaps a sad one…. Be respectful, of course, but also be self-respectful, and neither disparage yourself nor flatter the Justices. We think well enough of ourselves already. When the Court moved to Washington in 1800, it was provided with no books, which probably accounts for the high quality of early opinions. My philosophy has been and continues to be that [the Court] cannot and should not try to seize the initiative in shaping the policy of the law, either by constitutional interpretation or by statutory construction. While the line to be drawn between interpretation and legislation is difficult, and numerous dissents turn upon it, there is a limit beyond which the Court incurs the just charge of trying to supersede the law-making branches. Every Justice has been accused of legislating and every one has joined in that accusation of others. When the Court has gone too far, it has provoked reactions which have set back the cause it is designed to advance and has sometimes called down upon itself severe rebuke. When we went to school we were told that we were governed by laws, not men. As a result of that, many people think there is no need to pay any attention to judicial candidates because judges merely apply the law by some mathematical formula and a good judge and a bad judge all apply the same kind of law. The fact is that the most important part of a judge's work is the exercise of judgment and that the law in a court is never better than the common sense judgment of the judge that is presiding. Something happens to a man when he puts on a judicial robe, and I think it ought to. The change is very great and requires psychological change within a man to get into an attitude of deciding other people's controversies, instead of waging them. It really calls for quite a changed attitude. Some never make it - and I am not sure I have. "The Federal Prosecutor", 24 J. Am. Judicature Soc'y 18 (1940) (Address delivered at the Second Annual Conference of United States Attorneys, April 1, 1940). The prosecutor has more control over life, liberty, and reputation, than any other person in America. Nothing better can come out of this meeting of law enforcement officers than a rededication to the spirit of fair play and decency that should animate the federal prosecutor. Your positions are of such independence and importance that while you are being diligent, strict, and vigorous in law enforcement you can also afford to be just. Although the government technically loses its case, it has really won if justice has been done. The qualities of a good prosecutor are as elusive and as impossible to define as those which mark a gentleman. And those who need to be told would not understand it anyway. A sensitiveness to fair play and sportsmanship is perhaps the best protection against the abuse of power, and the citizen's safety lies in the prosecutor who tempers zeal with human kindness, who seeks truth and not victims, who serves the law and not factional purposes, and who approaches his task with humility. 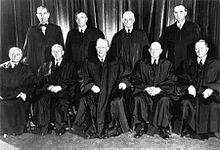 For a century every contest with the Supreme Court has ended in evading the basic inconsistency between popular government and judicial supremacy. While the Declaration was directed against an excess of authority, the Constitution was directed against anarchy. In 1945, at the request of President Franklin Delano Roosevelt, Justice Jackson took leave from the Supreme Court to act as a prosecutor in the Nuremberg trials of accused Nazi war criminals. We must never forget that the record on which we judge these defendants is the record on which history will judge us tomorrow. To pass these defendants a poisoned chalice is to put it to our own lips as well. Of one thing we may be sure. The future will never have to ask, with misgiving, what could the Nazis have said in their favor. History will know that whatever could be said, they were allowed to say. They have been given the kind of a Trial which they, in the days of their pomp and power, never gave to any man. The plans of Adolf Hitler for aggression were just as secret as Mein Kampf, of which over six million copies were published in Germany. He not only openly advocated overthrowing the Treaty of Versailles, but made demands which went far beyond a mere rectification of its alleged injustices (GB-128). He avowed an intention to attack neighboring states and seize their lands, which he said would have to be won with "the power of a triumphant sword." Here, for every German to hearken to, were the "ancestral voices prophesying war." Each of these men made a real contribution to the Nazi plan. Each man had a key part. Deprive the Nazi regime of the functions performed by a Schacht, a Sauckel, a Von Papen, or a Goering and you have a different regime. Look down the rows of fallen men and picture them as the photographic and documentary evidence shows them to have been in their days of power. Is there one who did not substantially advance the conspiracy along its bloody path toward its bloody goal? Can we assume that the great effort of these men's lives was directed toward ends they never suspected? … This may seem like a fantastic exaggeration, but this is what you would actually be obliged to conclude if you were to acquit these defendants. They do protest too much. They deny knowing what was common knowledge. They deny knowing plans and programmes that were as public as Mein Kampf and the Party programme. They deny even knowing the contents of documents which they received and acted upon. … The defendants have been unanimous, when pressed, in shifting the blame on other men, sometimes on one and sometimes on another. But the names they have repeatedly picked are Hitler, Himmler, Heydrich, Goebbels, and Bormann. All of these are dead or missing. No matter how hard we have pressed the defendants on the stand, they have never pointed the finger at a living man as guilty. It is a temptation to ponder the wondrous workings of a fate which has left only the guilty dead and only the innocent alive. It is almost too remarkable. It may well be said that Hitler's final crime was against the land he had ruled. He was a mad messiah who started the war without cause and prolonged it without reason. If he could not rule he cared not what happened to Germany. As Fritzsche has told us from the stand, Hitler tried to use the defeat of Germany for the self-destruction of the German people. He continued to fight when he knew it could not be won, and continuance meant only ruin... Hitler ordered everyone else to fight to the last and then retreated into death by his own hand. But he left life as he lived it, a deceiver; he left the official report that he had died in battle. This was the man whom these defendants exalted to a Fuhrer. It was they who conspired to get him absolute authority over all of Germany. And in the end he and the system they created for him brought the ruin of them all. The record is full of other examples of dissimulations and evasions. Even Schacht showed that he, too, had adopted the Nazi attitude that truth is any story which succeeds. Confronted on cross-examination with a long record of broken vows and false words, he declared in justification and I quote from the record: "I think you can score many more successes when you want to lead someone if you don't tell them the truth than if you tell them the truth." This was the philosophy of the National Socialists. When for years they have deceived the world, and masked falsehood with plausibilities, can anyone be surprised that they continue their habits of a lifetime in this dock? Credibility is one of the main issues of this Trial. Only those who have failed to learn the bitter lessons of the last decade can doubt that men who have always played on the unsuspecting credulity of generous opponents would not hesitate to do the same, now. It is against such a background that these defendants now ask this Tribunal to say that they are not guilty of planning, executing, or conspiring to commit this long list of crimes and wrongs. They stand before the record of this Trial as bloodstained Gloucester stood by the body of his slain king. He begged of the widow, as they beg of you: "Say I slew them not." And the Queen replied, "Then say they were not slain. But dead they are..." If you were to say of these men that they are not guilty, it would be as true to say that there has been no war, there are no slain, there has been no crime. "The Task of Maintaining Our Liberties: The Role of the Judiciary", 39 A.B.A. J. 961 (1953). For over a century it has been the settled doctrine of the Supreme Court that the principle of stare decisis has only limited application in constitutional cases. It might be thought that if any law is to be stabilized by a court decision it logically should be the most fundamental of all law -- that of the Constitution. But the years brought about a doctrine that such decisions must be tentative and subject to judicial cancellation if experience fails to verify them. The result is that constitutional precedents are accepted only at their current valuation and have a mortality rate almost as high as their authors. There is no such thing as an achieved liberty; like electricity, there can be no substantial storage and it must be generated as it is enjoyed, or the lights go out. Not every defeat of authority is a gain for individual freedom, nor every judicial rescue of a convict a victory for liberty. A Government to perform even a minimum of service to its people, must take steps to suppress avarice, to strike down privately built-up schemes of economic exploitation or oppression, to uproot privilege, and to assure justice and economic opportunity to the masses. No longer may the head of a state consider himself outside of the law, and impose inhuman acts on the peoples of the world. The power of citizenship as a shield against oppression was widely known from the example of Paul's Roman citizenship, which sent the centurion scurrying to his higher-ups with the message: "Take heed what thou doest: for this man is a Roman." The mere state of being without funds is a neutral fact — constitutionally an irrelevance, like race, creed, or color. There is no reason to doubt that this Court may fall into error, as may other branches of the Government. Nothing in the history or attitude of this Court should give rise to legislative embarrassment if, in the performance of its duty, a legislative body feels impelled to enact laws which may require the Court to reexamine its previous judgments or doctrine. [Footnote 52] The Court differs, however, from other branches of the Government in its ability to extricate itself from error. It can reconsider. Helvering v. Griffiths, 318 U.S. at 400-401 (1943). This Court is forever adding new stories to the temples of constitutional law, and the temples have a way of collapsing when one story too many is added. As to ethics, the parties seem to me as much on a parity as the pot and the kettle. But want of knowledge or innocent intent is not ordinarily available to diminish patent protection. A confession is wholly and incontestably voluntary only if a guilty person gives himself up to the law and becomes his own accuser. The physical power to get the money does not seem to me a test of the right to tax. Might does not make right even in taxation. To hold that what the use of official authority may get the state may keep, and that if it cannot get hold of a nonresident stockholder it may hold the company as hostage for him, is strange constitutional doctrine to me. Korematsu was born on our soil, of parents born in Japan. The Constitution makes him a citizen of the United States by nativity and a citizen of California by residence. No claim is made that he is not loyal to this country. There is no suggestion that apart from the matter involved here he is not law abiding and well disposed. Korematsu, however, has been convicted of an act not commonly a crime. It consists merely of being present in the state whereof he is a citizen, near the place where he was born, and where all his life he has lived. A citizen's presence in this locality, however, was made a crime only if his parents were of Japanese birth. Had Korematsu been one of four - the others being, say, a German alien enemy, an Italian alien enemy, and a citizen of American-born ancestors, convicted of treason, but on parole - only Korematsu's presence would have violated the order. The difference between their innocence and his crime would result, not from anything he did, said, or thought, different than they, but only in that he was born of different racial stock. Now, if any fundamental assumption underlies our system, it is that guilt is personal and not inheritable. Even if all of one's antecedents had been convicted of treason, the Constitution forbids its penalties to be visited upon him. But here is an attempt to make an otherwise innocent act a crime merely because this prisoner is the son of parents as to whom he had no choice, and belongs to a race from which there is no way to resign. If Congress in peace-time legislation should enact such a criminal law, I should suppose this Court would refuse to enforce it. [T]he effect of the religious freedom Amendment to our Constitution was to take every form of propagation of religion out of the realm of things which could directly or indirectly be made public business, and thereby be supported in whole or in part at taxpayers' expense. That is a difference which the Constitution sets up between religion and almost every other subject matter of legislation, a difference which goes to the very root of religious freedom[...] This freedom was first in the Bill of Rights because it was first in the forefathers' minds; it was set forth in absolute terms, and its strength is its rigidity. It was intended not only to keep the states' hands out of religion, but to keep religion's hands off the state, and, above all, to keep bitter religious controversy out of public life by denying to every denomination any advantage from getting control of public policy or the public purse. I do not know whether it is the view of the Court that a judge must be thick-skinned or just thick-headed, but nothing in my experience or observation confirms the idea that he is insensitive to publicity. Who does not prefer good to ill report of his work? And if fame — a good public name — is, as Milton said, the "last infirmity of noble mind", it is frequently the first infirmity of a mediocre one. No one will question that this power is the most dangerous one to free government in the whole catalogue of powers. It usually is invoked in haste and excitement when calm legislative consideration of constitutional limitation is difficult. It is executed in a time of patriotic fervor that makes moderation unpopular. And, worst of all, it is interpreted by judges under the influence of the same passions and pressures. Always, as in this case, the Government urges hasty decision to forestall some emergency or serve some purpose and pleads that paralysis will result if its claims to power are denied or their confirmation delayed. Under these circumstances, except for any personal humiliation involved in admitting that I do not always understand the opinions of this Court, I see no reason why I should be consciously wrong today because I was unconsciously wrong yesterday. But we have grounds to assume also that the normal proportion of them are subject to that very human weakness, especially displayed in Washington, which leads men to "crook the pregnant hinges of the knee where thrift may follow fawning." The choice is not between order and liberty. It is between liberty with order and anarchy without either. There is danger that, if the Court does not temper its doctrinaire logic with a little practical wisdom, it will convert the constitutional Bill of Rights into a suicide pact. Dissenting in Terminiello v. City of Chicago, 337 U.S. 1 (1949); this has sometimes been paraphrased as The Bill of Rights is not a suicide pact. But we must not forget that in our country are evangelists and zealots of many different political, economic and religious persuasions whose fanatical conviction is that all thought is divinely classified into two kinds — that which is their own and that which is false and dangerous. Our protection against all kinds of fanatics and extremists, none of whom can be trusted with unlimited power over others, lies not in their forbearance but in the limitations of our Constitution. I think that, under our system, it is time enough for the law to lay hold of the citizen when he acts illegally, or in some rare circumstances when his thoughts are given illegal utterance. I think we must let his mind alone. I am entitled to say of that opinion what any discriminating reader must think of it — that it was as foggy as the statute the Attorney General was asked to interpret. But an escape less self-depreciating was taken by Lord Westbury, who, it is said, rebuffed a barrister's reliance upon an earlier opinion of his Lordship: "I can only say that I am amazed that a man of my intelligence should have been guilty of giving such an opinion". If there are other ways of gracefully and good-naturedly surrendering former views to a better considered position, I invoke them all. Had the jury convicted on proper instructions it would be the end of the matter. But juries are not bound by what seems inescapable logic to judges. No penance would ever expiate the sin against free government of holding that a President can escape control of executive powers by law through assuming his military role. He who must search a haystack for a needle is likely to end up with the attitude that the needle is not worth the search. Reversal by a higher court is not proof that justice is thereby better done. There is no doubt that if there were a super-Supreme Court, a substantial proportion of our reversals of state courts would also be reversed. We are not final because we are infallible, but we are infallible only because we are final. We granted certiorari, and in this Court the parties changed positions as nimbly as if dancing a quadrille. I should concur in this result more readily if the Court could reach it by analysis of the statute instead of by psychoanalysis of Congress. When we decide from legislative history, including statements of witnesses at hearings, what Congress probably had in mind, we must put ourselves in the place of a majority of Congressmen and act according to the impression we think this history should have made on them. Never having been a Congressman, I am handicapped in that weird endeavor. That process seems to me not interpretation of a statute but creation of a statute. The duty to disclose knowledge of crime rests upon all citizens. If it be conceded that in some way [that the agency could take the action it did], does it matter what the procedure is? Only the untaught layman or the charlatan lawyer can answer that procedure matters not. Procedural fairness and regularity are of the indispensable essence of liberty. Severe substantive laws can be endured if they are fairly and impartially applied. Indeed, if put to the choice, one might well prefer to live under Soviet substantive law applied in good faith by our common-law procedures than under our substantive law enforced by Soviet procedural practices. Let it not be overlooked that due process of law is not for the sole benefit of an accused. It is the best insurance for the Government itself against those blunders which leave lasting stains on a system of justice but which are bound to occur on ex parte consideration. 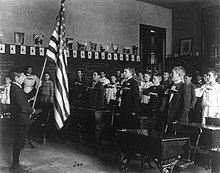 West Virginia State Board of Education v. Barnette, 319 U.S. 624 (1943), was a case in which the United States Supreme Court held that members of the Jehovah's Witnesses could not be compelled to salute the flag of the United States. Government of limited power need not be anemic government. Assurance that rights are secure tends to diminish fear and jealousy of strong government, and by making us feel safe to live under it makes for its better support. Struggles to coerce uniformity of sentiment in support of some end thought essential to their time and country have been waged by many good, as well as by evil, men. Nationalism is a relatively recent phenomenon, but, at other times and places, the ends have been racial or territorial security, support of a dynasty or regime, and particular plans for saving souls. As first and moderate methods to attain unity have failed, those bent on its accomplishment must resort to an ever-increasing severity. As governmental pressure toward unity becomes greater, so strife becomes more bitter as to whose unity it shall be. Ultimate futility of such attempts to compel coherence is the lesson of every such effort from the Roman drive to stamp out Christianity as a disturber of its pagan unity, the Inquisition, as a means to religious and dynastic unity, the Siberian exiles as a means to Russian unity, down to the fast failing efforts of our present totalitarian enemies. United States v. Ballard, 322 U.S. 78, 95 (1944), was an appeal of the conviction of two leaders of the new religious "I AM" Activity movement for fraudulently seeking and collecting donations on the basis of religious claims that the defendants themselves did not believe. The United States Supreme Court held that the question of whether the defendants' claims about their religious experiences were actually true should not have been submitted to a jury. Jackson wrote the dissenting opinion. I should say the defendants have done just that for which they are indicted. If I might agree to their conviction without creating a precedent, I cheerfully would do so. I can see in their teachings nothing but humbug, untainted by any trace of truth. But that does not dispose of the constitutional question whether misrepresentation of religious experience or belief is prosecutable; it rather emphasizes the danger of such prosecutions. I do not know what degree of skepticism or disbelief in a religious representation amounts to actionable fraud. James points out that "Faith means belief in something concerning which doubt is theoretically possible." Belief in what one may demonstrate to the senses is not faith. All schools of religious thought make enormous assumptions, generally on the basis of revelations authenticated by some sign or miracle. The appeal in such matters is to a very different plane of credibility than is invoked by representations of secular fact in commerce. Some who profess belief in the Bible read literally what others read as allegory or metaphor, as they read Aesop's fables. Religious symbolism is even used by some with the same mental reservations one has in teaching of Santa Claus or Uncle Sam or Easter bunnies or dispassionate judges. It is hard in matters so mystical to say how literally one is bound to believe the doctrine he teaches, and even more difficult to say how far it is reliance upon a teacher's literal belief which induces followers to give him money. The chief wrong which false prophets do to their following is not financial... But the real harm is on the mental and spiritual plane. There are those who hunger and thirst after higher values which they feel wanting in their humdrum lives. They live in mental confusion or moral anarchy, and seek vaguely for truth and beauty and moral support. When they are deluded and then disillusioned, cynicism and confusion follow. The wrong of these things, as I see it, is not in the money the victims part with half so much as in the mental and spiritual poison they get. But that is precisely the thing the Constitution put beyond the reach of the prosecutor, for the price of freedom of religion or of speech or of the press is that we must put up with, and even pay for, a good deal of rubbish. The bolded section is often incorrectly reported as "The price of freedom of religion, or of speech, or of the press, is that we must put up with a good deal of rubbish". Korematsu v. United States, 323 U.S. 214 (1944), was a landmark United States Supreme Court case concerning the constitutionality of Executive Order 9066, which ordered Japanese Americans into internment camps during World War II regardless of citizenship. Jackson wrote one of the three dissenting opinions. Korematsu was born on our soil, of parents born in Japan. The Constitution makes him a citizen of the United States by nativity, and a citizen of California by residence. No claim is made that he is not loyal to this country. There is no suggestion that apart from the matter involved here, he is not law-abiding and well-disposed. Korematsu, however, has been convicted of an act not commonly a crime. It consists merely of being present in the state whereof he is a citizen, near the place where he was born, and where all his life he has lived. Zorach v. Clauson, 343 U.S. 306 (1952) was a case in which the Court held that an arrangement by a school district of allowing students to leave school for part of the day to receive religious instruction was not unconstitutional. Jackson wrote one of the three dissenting opinions. It is possible to hold a faith with enough confidence to believe that what should be rendered to God does not need to be decided and collected by Caesar. If we concede to the State power and wisdom to single out "duly constituted religious" bodies as exclusive alternatives for compulsory secular instruction, it would be logical to also uphold the power and wisdom to choose the true faith among those "duly constituted." We start down a rough road when we begin to mix compulsory public education with compulsory godliness. Nature had given him a bright, strong mind--it was one of the best three or four, possibly five, of the Court during his years of service. It was a disciplined mind — self disciplined, and sharpened by the varied incidents of a general practice. He had attended no college. His engaging style, his easy acquaintance with good literature, he had acquired for himself. Even in his one year of law school, his training had been in practical subjects taught by practical men. The assurance and courage that come from professional mastery, that too he had won for himself. So he became an exemplar of the best virtues we attribute to our tough common-law system. He thought in terms of concrete operations: a good judge should feel responsible for the practicality of his judgments. He displayed, too, a constant concern that the Court's pronouncements convey to the practitioner a workable rule of conduct. To his fingertips, he retained a feel for active practice. This was the American lawyer at his best. What he made of himself is an inspiration and a challenge to all who follow his calling. He will live in the living law of the Constitution. His speech breaks through the printed page. He was one of those rare men whose spoken word survives in type. Self-reliance, good-humored tolerance, recognition of the other fellow's right to be and to thrive, even though you may not think he is as good as you are, suspicion of authority as well as awareness of its need, disdain of arrogance and self-righteousness, a preference for truculent independence over prudent deference and conformity - these were the feelings that shaped his outlook on life. He liked his kind without being sentimental about it; he was gregarious but shy about intimacies. As Attorney General, Solicitor General, and Assistant Attorney General,…he lost but a single case in the Supreme Court. Against [that] may be tallied some twenty-seven arguments which he won. He had a quiet courage, which never led to a bellow of defiance but which permitted him to take in every instance the action he thought best without discernible thought of criticism or personal injury. He was modest in manner, yet supremely confident of himself and his judgment. He had a calm which no crisis could disturb, and standards of honorable conduct which were both rigorous and unshakeable. Robert Jackson represented the advocate at his best. He possessed the rare combination of a good jury personality and the qualities of a profound lawyer. He knew how to talk persuasively to a jury of Chautauqua County farmers, yet he could argue the points of law involved in the case with great learning and with unanswerable logic, either before the trial judge or an appellate court. He had high standards of craftsmanship as a lawyer; he was thorough and painstaking in preparation. He had a reservoir of learning, from which he drew gracefully and effortlessly. But the most marked quality of his judicial and non-judicial writing was not the ability to borrow an apt quotation or to find an idea well expressed by one who had written before him; it was the ability to think brilliantly in original and bold fashion and to express his thoughts in forceful and eloquent English of a style inimitably his own. His writing was pithy and pungent; yet he never sacrificed clarity of thought for a well-turned phrase. He was a master of the paradox; he had a great love of alliteration and his antithetical statements were gems. Yet his wit never descended to the frivolous; it always added a barb to the telling point. His wit was especially telling when turned upon himself or his Court. To an unusual degree in the history of the Court, Justice Jackson wrote as he felt. In his case the style was the man….He wrote as he talked and he talked as he felt. The fact that his opinions were written talk made them as lively as the liveliness of his talk. He had 'impish candor', to borrow one of his own phrases. Candor, indeed, was one of his deepest veins. There was nothing stuffy about him and therefore, nothing stuffy about his writing. No man who ever sat on the Supreme Court, it seems to me, mirrored the man in him in his judicial work more completely than did Justice Jackson. 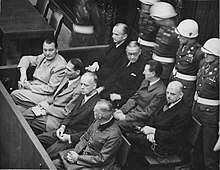 Discussion of the concept of supreme crime introduced by Justice Jackson, as chief prosecutor for the United States at the Nuremberg Trials, with applications to today. This page was last edited on 13 February 2019, at 23:09.